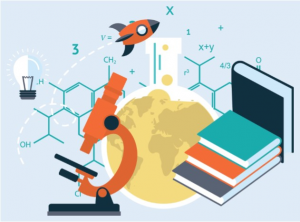 This page contains information to help research administrators as they use ConnectCarolina and InfoPorte to support principal investigators who are doing sponsored research at UNC. A new PI Dashboard in InfoPorte gives principal investigators a snapshot of their grant funding and expenses, including salary projections, at both the award level and project level. As a research administrator, you can get access to see the PI Dashboards for the principal investigators you support. You’ll need to work with the InfoPorte Administrator of the PI’s home department. To find out who the InfoPorte Administrators are, click InfoPorte Administrators and Access Request Coordinators. 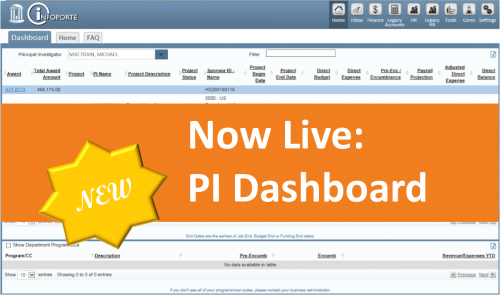 For details about using the PI Dashboard, click Working With the Principal Investigator Dashboard. For information about how you can support your PI using the PI Dashboard, click For Research Admins: Working With the PI Dashboard. Take a look at the Frequently Asked Questions to see the answers to questions the ConnectCarolina team received during testing. The Grant Profile Tab in InfoPorte provides an overview of grant, including project start and end dates, primary investigator, project status, budget, expenses, encumbrances, and projected earnings. The Grant Details Tab in InfoPorte shows more detailed information than the Grant Profile tab, including award number, sponsor information, and personnel details. The Budget Overview Inquiry in ConnectCarolina shows expense totals and available balance by budget chartfield strings in real-time. It breaks out spending totals by pre-encumbrance, encumbrance and expense; and let’s you filter on project and source. The OSR GL Expense and Budget Report in ConnectCarolina shows expenses and budget balances for a grant based on expenses that have posted to the GL Actuals ledger. The GL Activity Tab in InfoPorte can be used to monitor your OSR projects for any expenses reported to outside agencies based on actuals reflected on GL actuals ledger. The C&G Expenditures – Summary Report in InfoPorte displays all contract and grant expenses for the selected period, department, project, or source and is summarized by Project ID, Expenditure Group and Expenditure Type for contracts and grants. The C&G Expenditures – Account Level Report in InfoPorte displays all contract and grant expenses for the selected period, department, project, or source at the detail level by Project ID, Expenditure Group and Expenditure Type for contracts and grants. The Payroll Accounting Report in InfoPorte shows payroll expenses by financial accounting date for reconciliation and grants billing. The Comprehensive Financial Summary Report in InfoPorte shows fund and cash balances for OSR funds. The OSR Invoice Listing Report in InfoPorte shows all invoices sent to sponsors since the beginning of a project based on transactions posted to the General Ledger. You can also see the balance of your project’s budget. The OSR Payments Report in InfoPorte displays all AR payment transactions that have hit a cash account for that project which include AR Direct Journals, AR payments, AR worksheet items and AR maintenance trasactions. The OSR Contract Closeout Report, found in InfoPorte on the OSR Financial Reporting Tab, is used to facilitate Award/Contract closeout systematically. This report will serve as a tool to ensure all OSR close out processing, status validation, and other reconciliation processes have been completed successfully. NC_CPS_AR_DJ_PMTS_BY_PROJECT – Shows OSR deposits via direct journal. There is no associated invoice. NC_CPS_AR_OSR_PAYMENTS_BY_PROJ – Shows invoice generated to sponsor and payment received. NC_CPS_AR_OSR_OPEN_ITEMS – Shows invoice generated to sponsor and payment not received. NC_CPS_KK_PROJECT_SUM – Shows available balance, pre-encumbrance, encumbrance, and expense on OSR funds. NC_CPS_KK_PROJECT_DATA – Shows all OSR projects with chartfield strings and Commitment Control end date. Note: The query NC_KK_PROJECT_DATA in ConnectCarolina Query Viewer contains the project end date. NC_CPS_KK_WRONG_PROJECT_QRY – Identifies non-cost sharing OSR balances for projects that have a department that is outside the Grants Project-Department range. Use the buttons below to get more information about how salary projections are calculated in ConnectCarolina.